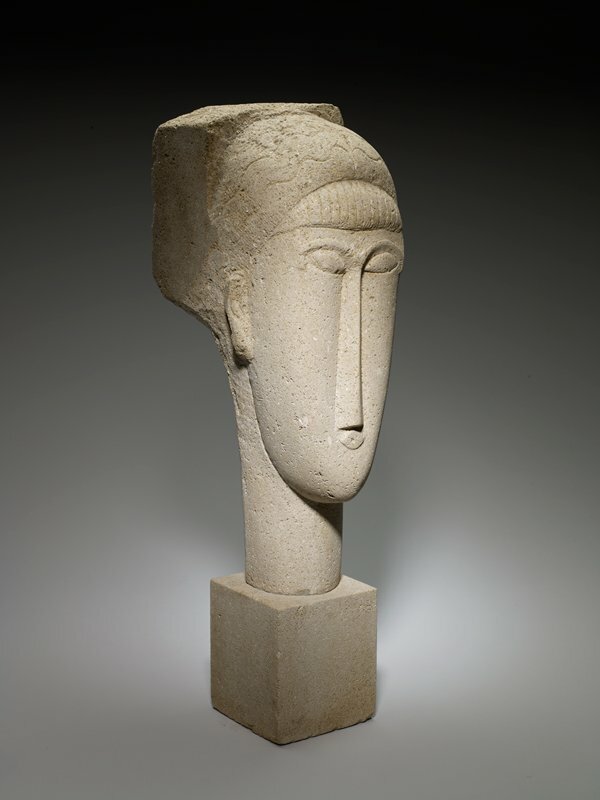 A protaganist of the vibrant artistic community in Paris around 1910, the Italian Amedeo Modigliani sought to establish a new sculptural language, inspired significantly by African and ancient Greek and Egyptian examples. The present Head was one of seven that were exhibited at the Salon d'Automne in Paris in October 1912. A few months earlier, it was photographed in the artist's studio - which makes it one of his best-documented works. Modigliani intended for the heads to be parts of 'columns of tenderness' within a primordial 'temple of beauty' that remained unrealized. According to the account of his close friend Jacob Epstein, Modigliani used to place candles on top of these heads during the night. Spurred on by marijuana, he would give the totemic, illuminated sculptures affectionate embraces. Apple not fall far from art?